Taffy included in this gift basket is bonomo turkish taffy, kits nostalgic taffy, b b bat taffy suckers, bit o honey bar, mary jane, Albert fruit chews, mini frooties - fruit flavored tootsie rolls, wonka laffy taffy , large tangy taffy bar, air head and sugar daddy pop mini suckers. This gift basket full of taffy is a great gift basket for any occasion. 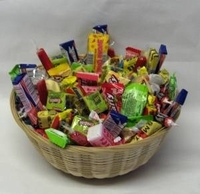 Everything in this candy basket is nothing but chewy fruity taffy, give this gift basket to someone who loves taffy and they will be in heaven. They will have hours of fruity chewing fun. This taffy gift basket is great for birthdays, father's day, mother's day or a get well pick me up. You can't go wrong with this mixture of candy from the 50's,60's and 70's. Gift basket is a wicker basket size and style may vary, but never the taffy.